A new fossil discovery captures a previously unseen stage in the evolution of ancient arthropods, providing confirmation of the loss of a limb branch during horseshoe crab evolution. Horseshoe crabs, including the iconic Limulus we know today, have existed for more than 450 million years. Over that long history, evolutionary change has particularly affected the nature of their legs. A new fossil discovery in Britain captures a previously unseen stage in the evolution of these ancient arthropods — the transformation of two-branched legs into nearly identical but separately attached limbs, one of which was destined to disappear. “This fossil provides remarkable confirmation of the loss of a limb branch during horseshoe crab evolution, a change predicted by the common presence of two branches in the arthropods that appeared earlier, during the Cambrian explosion,” said Derek E. G. Briggs, director of the Yale Peabody Museum of Natural History and lead author of a paper to be published online the week of Sept. 10 in the journal PNAS. The fossil dates from the Silurian period, about 425 million years ago. Modern horseshoe crabs (Limulus) have segmented legs at the front, which they use for walking and feeding. Their rear legs form flattened gills for breathing. In their ancestors, scientists believe, these functions were combined in limbs with two branches — one limb for walking and eating, one for breathing. Scholars have long assumed that modern horseshoe crabs had lost the extra limb branch as its function was assumed by the limbs at the rear, which form book-like gills. The newly discovered fossil, a 23 mm specimen representing a new genus and species called Dibasterium durgae, shows 4 two-branched limbs, with an important distinction: The extra branch is not attached to the primary limb, but instead originates independently on the body like an extra leg. It appears that the branches first separated before the outer one was lost. Combined with genetic analysis, the new fossil evidence suggests that repression or loss of gene expression might have yielded the modern horseshoe crab’s appendage structure. “This discovery should prompt further investigation of the genes that control limb development in living horseshoe crabs, as the process is not fully understood,” said Briggs. The name of the new fossil, Dibasterium durgae, refers to the double limbs and to Durga, the Hindu goddess with many arms. It was reconstructed in three dimensions by stacking digital images of physical surfaces exposed by grinding away layers in tiny increments. The fossil was found in the mid-Siluran Lagerstaette, on the English-Welsh border, a site rich in well preserved, soft-bodied fossils. The other authors of the paper are Derek Siveter (University of Oxford), David Siveter (University of Leicester), Mark Sutton and David Legg (Imperial College, London), and Russell Garwood (University of Manchester). Support for the research was provided by the Natural Environmental Research Council. 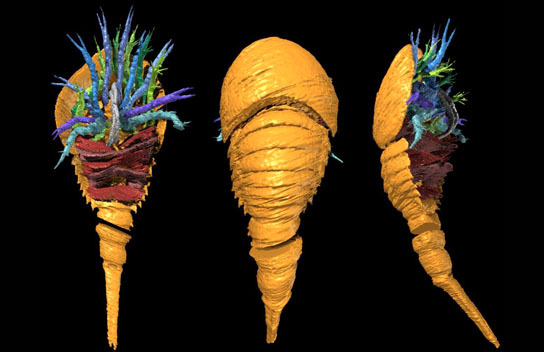 Be the first to comment on "Fossil Discovery Captures a Previously Unseen Stage in the Evolution of Ancient Arthropods"